The full promise of governance reform, transitional justice and economic revival is yet to be delivered by the ruling National Unity Government in Sri Lanka, and risks stalling or dissipating., the UN’s top envoy for Human Rights, Zeid Al Ra’ad Al Hussein will tell the 47-member Human Rights Council in Geneva tomorrow (29 June). According to an advance copy released late last night by the Office of the High Commissioner for Human Rights (OHCHR) of Zeid’s first report to the UNHRC since the adoption of the September 2015 resolution that Sri Lanka co-sponsored, the High Commissioner will highlight institutional blockades hampering reconciliation efforts, the complexity of party politics within the coalition and the importance of constitutional reform, while calling for a full and independent investigations into new allegations that cluster munitions were used during the war. “Negotiating party politics and power sharing within the coalition has proved complex as the Government seeks to build and retain the two-thirds majority in parliament necessary to reform the Constitution. This is manifest in an extensive Cabinet with overlapping ministerial mandates, and mixed messages on crucial issues such as accountability,” the advance copy of Zeid’s speech notes. The High Commissioner will inform the Human Rights Council that from a human rights perspective, the constitutional reform process in Sri Lanka presents an important opportunity to rectify structural deficiencies that contributed to human rights violations and abuses in the past and reinforce guarantees of non-recurrence. “These could include a more comprehensive Bill of Rights, stronger institutional checks and balances, enhanced constitutional review, improved guarantees for the independence of the judiciary, effective individual complaints mechanisms and greater direct enforceability of international human rights treaty,” the High Commissioner’s oral report will note. 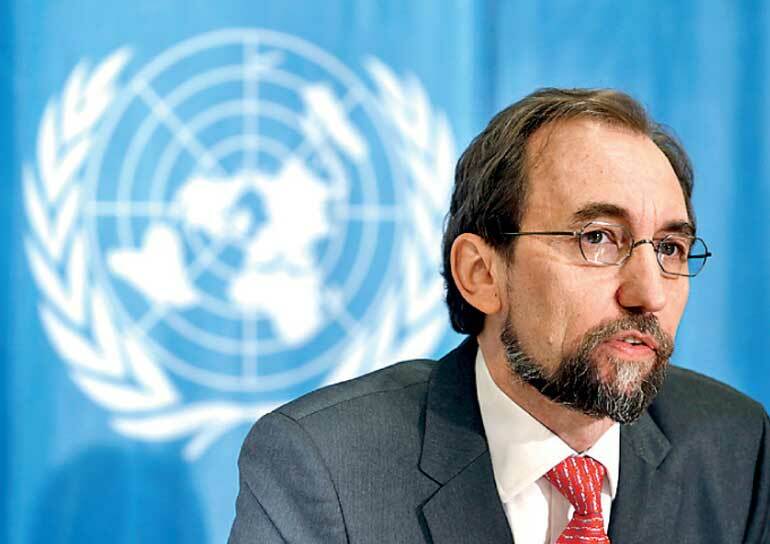 “At the same time, the High Commissioner hopes that the political process of adopting constitutional changes will not involve trade-offs and compromises on core issues of accountability, transitional justice and human rights,” Zeid warns. He will also hail what he calls ‘symbolic steps’ by the Government to promote reconciliation and change the ‘majoritarian political culture,’ including the singing of the national anthem in Sinhala and Tamil at independence day celebrations and the de-listing of Tamil diaspora organisations and individuals proscribed under the PTA. Zeid will inform the Council that a key question that remains with regard to Sri Lanka’s justice seeking process, is the participation of international judges, prosecutors, investigators and lawyers in a judicial mechanism. Zeid will note in his speech to the Council that in late May 2016, while addressing a large group of senior military officers, the Prime Minister was reported to have again ruled out international participation in a domestic Sri Lankan justice mechanism. “The High Commissioner remains convinced that international participation in the accountability mechanisms would be a necessary guarantee for the independence and impartiality of the process in the eyes of victims, as Sri Lanka’s judicial institutions currently lack the credibility needed to gain their trust. It is also important to keep in mind the magnitude and complexity of the international crimes alleged, which the OHCHR investigation found could amount to war crimes and crimes against humanity,” the advance copy says.